IMPORTANT UPDATE: TINA HAS BEEN ADOPTED! HER BROTHER TIMBER IS SO HAPPY FOR HER, BUT HE HOPES HIS SPECIAL SOMEONE COMES TO MEET HIM AND WANTS TO ADOPT HIM VERY SOON! -an elite group of bonded cats who put their BFF’s welfare above their own. They are overlooked at Last Hope in Wantagh..perhaps their cage is too dark. Maybe a disco ball or spotlight in their Last Hope Wantagh cage would attract more people over to meet them. They are calling an electrician . 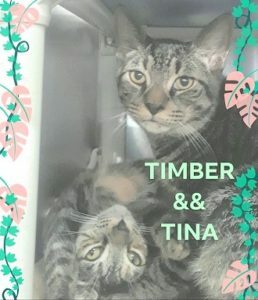 While they wait, TIMBER & TINA will continue to groom & love each other. They want to LOVE YOU TOO. This entry was posted in Adult, Cats, Wantagh Adoption Center. Bookmark the permalink.